The productboard extension for Chrome helps your colleagues capture just the most actionable insights about users, categorize them, and submit them to your Insights board. Once in productboard, these insights will help you prioritize what to build next. They'll also helps designers and developers see the context behind each feature idea they're bringing to life. With the extension, contributors can highlight text on any webpage or webapp (like Intercom) and submit it to productboard in two clicks. Or, select the extension icon without highlighting any text to write or paste user insights free-form. 5 ) Once they see their input linked to related feature ideas in productboard, your colleagues will know they've been heard. And you'll have that much more information when making product decisions. Note: It is not yet possible to highlight text in Google docs and automatically load it into the extension. Note: Users of the contributor user role can only process their own notes on the I board. Note: Colleagues who have not been invited into your project as a contributor, editor, or admin can still submit feedback by sending emails to your project's unique address. Does your team use Intercom Respond or Zendesk to communicate with leads and customers? 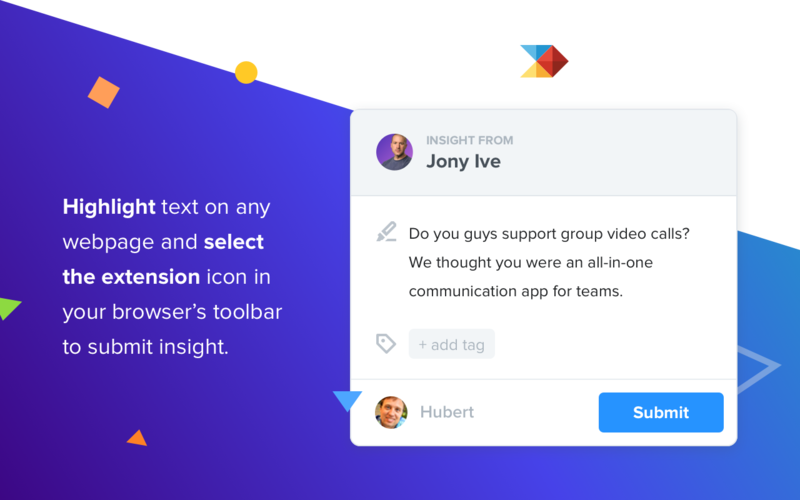 When you highlight text in an Intercom conversation or Zendesk support ticket, this extension automatically grabs the highlighted text and identifies who provided the feedback! In case this doesn't work as well, killing Chrome and opening it again should fix the issue. We’re here for you. Use the in-app chat or write us at hello@productboard.com. For more information on how to install and manage Chrome extensions, check out Google's support page.